I know that I have to make sure for convergence (namely the end is reachable), and to do this until there are no more doors on the openDoors list. right now I am simply trying to get this to work in 2D (there are rules that introduce 3D), but I am working on a presumption that a rigorous algorithm can be trivially extended to 3D. if caseEdge (which can also occur in between rooms) then put the door on a toBeClosed list, and remove it from the open list (placing a wall or something there). then to do some kind of test that both the start, and the goal are connected, and reachable from each other (each room has nodes for AI, but I don't want to "have" to pull those out to accomplish this). but this logic has the problem for say the U, or L shaped rooms in my example, and then I also have a problem conceptually if the room needs to be rotated. As I explained before, since there are already good algorithms to perform pathfinding, space filling etc, you could simplify the work by setting up the initial rooms. Since it's a game world, the goal is not just to fill up a grid with rooms, but to create a space where a player can move around following a game logic. Each door have its own properties (one-way, two-ways, locked, etc). A player can enter/exit a room only by a door. Each room must be 'solved': it must be possible, starting from any door, to reach each of the other doors in the room. For each room, some particular rotations could be avoided to ensure the previous rule. Rooms are connected by doors, and connected doors must be of the same size. By 'door' I mean any kind of passage. Even empty space can be a door. Since these prerequisites are met per-room, you can create rooms as complex as you need because it won't affect your algorithm (the number of doors per room WILL affect the computing time). I.E. : to avoid a corridor with a door on the end to become vertical and so requiring a huge jump/fall you can set those 2 rotation as off-limit. That way, when the filling algorithm tries to set that room, it will discard it if it would require that illegal rotation. Also, if the player suddenly gains the ability to fly, it still won't affect your algorithm directly: it will affect the 'solving' ability for each room and the possible rotations. After this setup, the case is similar to inventory-filling/pathfinding/maze solving, depending on what you actually need. Every time the algorithm choose a candidate solution, with a simple check to enforce previous rules you'll have it discard it or keep it, without modifying the algorithm itself. I think that the possibility to rely on a solid external algorithm is a huge advantage over a custom-tailored one. Then just knock out sections of walls to make larger rooms. Make sense? You could probably create more diverse and interesting results this way, with faster compute speed. Not the answer you're looking for? Browse other questions tagged algorithm procedural-generation or ask your own question. How to select random points within grid meeting min/max distance requirements from each other? What is the most appropriate path-finding solution for a very large proceduraly generated environment? How do I implement level generation based on graph grammars? 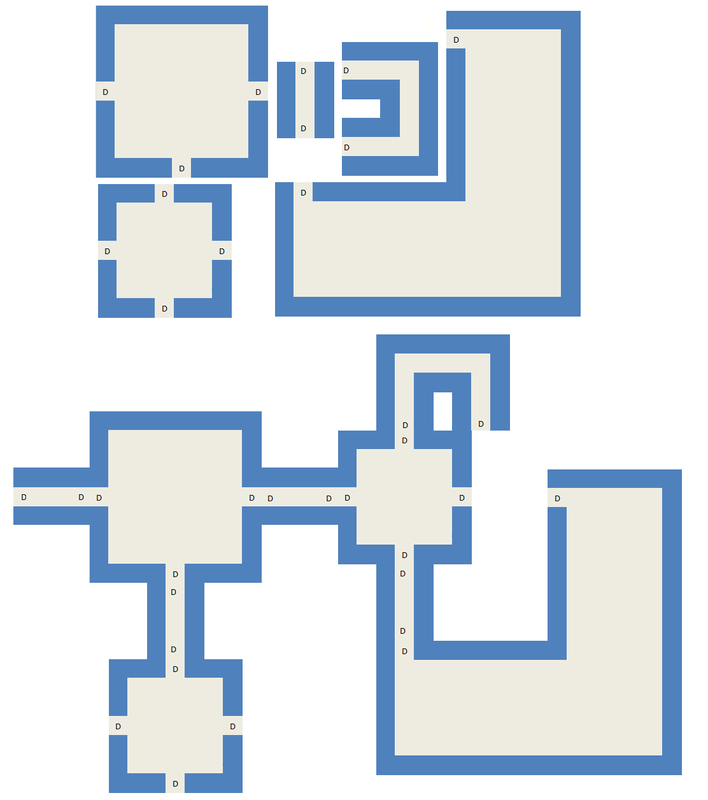 What algorithm should I use to laid out pre-made rooms into a level?